I had seen this great song three times performed by Bob, the first two times in Cologne and Halle 1994 (the first two of forty concerts to date I have attended with my sweet loving wife). In Kerkrade 1995 we had the pleasure again to see Bob deliver the strong statements he wrote in this song. Only once this song has been performed in 1999, in Galicia, early into his European tour (first time since Bournemouth 1997). Nineteen months later, in November 2000, Dylan pulled out "GOD KNOWS" again in the US, during his college tour, on the east coast, reminding his audience that "there's gonna be no more water but fire next time", knowing that this world full of sin is going be destroyed again. "Be ready, don't wait too late", for "you ain't gonna be taking nothing with you when you go." In Lowell he sang "GOD KNOWS" for the first time in the same concert as "NOT DARK YET", and in Lewiston he sang for the first time "GOD KNOWS" in the same concert as "TRYIN' TO GET TO HEAVEN". The only performance of "GOD KNOWS" in 2001 was in Anzio, Italy, where it appeared for the second time on the same setlist as "TRYIN' TO GET TO HEAVEN". In 2002 and 2003 it was not performed at all, but in April 2004 "GOD KNOWS" opened the last of three shows in Washington D.C., again in the same set as "TRYIN' TO GET TO HEAVEN". The same show also featured "FOREVER YOUNG", "BLIND WILLIE MC TELL", "I SHALL BE RELEASED", and "I BELIEVE IN YOU". Two months later, in Atlantic City, "GOD KNOWS" started the third show in June, which again featured also "FOREVER YOUNG", "TRYIN' TO GET TO HEAVEN", "BLIND WILLIE MC TELL" and "I SHALL BE RELEASED". Three weeks after that, during the European tour, in Galway, Ireland, I had the pleasure to witness a magnificent version of "GOD KNOWS" which was quite an intense performance, and its grave warnings (God knows there's gonna be no more water but fire next time. ... God knows it could snap apart right now just like putting scissors to a string. ... God knows you ain't gonna be taking nothing with you when you go) were delivered with the same conviction as the encouragement which closed the song (God knows there's a purpose, God knows there's a chance, God knows you can rise above the darkest hour of any circumstance). For me this gem was the peak of a brilliant concert, which also included "NOT DARK YET". It was only the second time ever (the first one was in November 2000) that those two songs were performed in one concert, and both times they were separated by only one song in between. 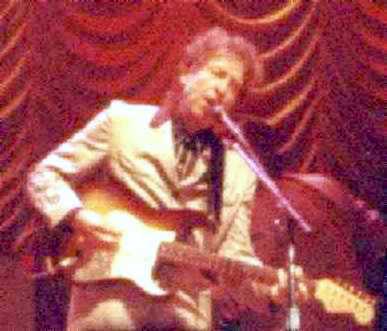 Two weeks later, in Córdoba, "GOD KNOWS" was performed once more in the same set as "FOREVER YOUNG", "BLIND WILLIE MC TELL", and "I SHALL BE RELEASED"; and four weeks after that, back in the US, Bob Dylan chose to perform "GOD KNOWS" for the first time ever in the same set as "SAVING GRACE", and this during a show which also featured the third performance ever of "PO' BOY". One week later, in Richmond, "GOD KNOWS" appeared once more in the same show as "I SHALL BE RELEASED", "BLIND WILLIE MC TELL", and "TRYIN' TO GET TO HEAVEN". Another week later I was made aware that all six performances of "GOD KNOWS" in 2004 until then had happened on a Sunday. That was a few hours before Bob performed "GOD KNOWS" in South Bend, Indiana, again on a Sunday. It appeared in a set which also included "I SHALL BE RELEASED" and "TRYIN' TO GET TO HEAVEN". One week later, on the last Sunday of the tour, in Rochester, Minnesota, "GOD KNOWS" was performed once more in the same show as "FOREVER YOUNG" and "TRYING TO GET TO HEAVEN". This trend continued during the fall tour of 2004, as "GOD KNOWS" was again performed in another Sunday show, in Berkeley, California, this time in the same concert as "FOREVER YOUNG", "TRYING TO GET TO HEAVEN" and "BLIND WILLIE MC TELL". The following Sunday, in Boulder, Colorado, "GOD KNOWS" appeared again, once more in the same set as "FOREVER YOUNG". On the next Sunday, in De Kalb, Illinois, "GOD KNOWS" was performed in the same concert as "FOREVER YOUNG", "BLIND WILLIE MC TELL" and "NOT DARK YET". And on the following Sunday "GOD KNOWS" appeared again, in the same concert as "FOREVER YOUNG". One week later, during the next Sunday show, in Binghampton, New York, "GOD KNOWS" was performed together with gems like "I SHALL BE RELEASED", "PO' BOY", and "NOT DARK YET". And on Sunday next, in Cambridge, Massachusetts, during the last show of the year 2004, "GOD KNOWS" was performed one more time in the same set as "FOREVER YOUNG". During the first Sunday show of 2005, in Chicago, Bob Dylan chose to sing "GOD KNOWS" in the same set as "SEÑOR", "SHOOTING STAR", "TRYIN' TO GET TO HEAVEN", "A HARD RAIN'S A-GONNA FALL", and "I SHALL BE RELEASED", creating a very strong and thought provocing juxtopostion of some fine songs. Two Sundays later, during the third Boston show, another fine juxtoposition of great songs was to be heard, including "GOD KNOWS", "A HARD RAIN'S A-GONNA FALL", "TRYIN' TO GET TO HEAVEN", "I BELIEVE IN YOU", and "RING THEM BELLS". On the following Sunday, in Atlantic City, "GOD KNOWS" appeared in an even finer setlist, together with "RING THEM BELLS", "TRYIN' TO GET TO HEAVEN", "I BELIEVE IN YOU", "A HARD RAIN'S A-GONNA FALL", and "MISSISSIPPI". During the May to July stadium tour of 2005, "GOD KNOWS" was performed during all six Sunday shows, and all six times together with "TRYIN' TO GET TO HEAVEN". Three of the times they appeared in the same show as "SHOOTING STAR", two of the times together with "SEÑOR", and on the last Sunday together with the only "I SHALL BE RELEASED" of the tour. Three more times "GOD KNOWS" was performed during July 2005, as there were three more Sunday shows; the first appearance was together with "BLIND WILLIE MC TELL", the second with "SHOOTING STAR", "TRYIN' TO GET TO HEAVEN", and "A HARD RAIN'S A-GONNA FALL", and the third together with "I BELIEVE IN YOU" and "I SHALL BE RELEASED", during the last show before a two and a half months touring break, which was followed by the European tour of 2005. During this fine European tour in the fall of 2005 "GOD KNOWS" appeared as the third song during all five Sunday concerts, in Wetzlar, in Erfurt, in Zürich, in London, and in Dublin. Every time it was preceded by "SEÑOR". In Wetzlar these two gems shared a set list also with "A HARD RAIN'S A-GONNA FALL" and the only "SHOOTING STAR" of the tour; and in Erfurt also with "A HARD RAIN'S A-GONNA FALL" and the only "RING THEM BELLS" of the tour. In Zurich they appeared together with the only "STANDING IN THE DOORWAY" of the tour, and with one of the five fall versions of "EVERY GRAIN OF SAND"; and during the last show of the year, in Dublin, it appeared once more together with "EVERY GRAIN OF SAND". In Erfurt, "GOD KNOWS" felt even stronger than a week before in Wetzlar, both versions featuring the rare last verse of the song, this time even delivered with more conviction. "God knows there's a heaven, God knows it's out of sight, God knows we can get all the way from here to there even if we've got to walk a million miles by caaaaaaaandlelight". But also sung with the same intensity and conviction were lines like: "God knows you ain't gonna be taking nothing with you when you go", "God knows there's gonna be no more water but fire next time", and even "God knows everything". Since 04/04/04, which saw the first performance of "GOD KNOWS" since July 2001, this song has been performed only on a Sunday; and since August 2004 "GOD KNOWS" appeared during every single Sunday concert by Bob Dylan, and most of the time in combination with two or three other songs, for which some strong biblical references would be not hard to find. Some of these other songs appear more often than others. And sure enough, three weeks later, back in Ireland, we saw another fine version of "GOD KNOWS", during the last show of the year. And as I agreed with Bob singing these lyrics in Wetzlar and in Erfurt, so I agreed with him in Dublin. "God knows there's gonna be no more water but fire next time. … God knows everything, God knows it could snap apart right now just like putting scissors to a string." During the sixth show of the 2006 spring tour, in Sun City West, Arizona, "GOD KNOWS" had its first appearance not on a Sunday since 2001, but as in Zurich and Dublin during the previous tour, it was performed again in the same set as "EVERY GRAIN OF SAND". Scoffers will come in the last days with scoffing, following their own sinful desires. They will say, “Where is the promise of his coming? For ever since the fathers fell asleep, all things are continuing as they were from the beginning of creation.” For they deliberately overlook this fact, that the heavens existed long ago, and the earth was formed out of water and through water by the word of God, and that by means of these the world that then existed was deluged with water and perished. But by the same word the heavens and earth that now exist are stored up for fire, being kept until the day of judgment and destruction of the ungodly.